Voidomatis or Vouidomatos beach (i.e. the eye of an ox) is located about 63km south of Heraklion, on the southern slopes of the Asterousia mountains. This beautiful and isolated beach lies at the exit of the Mesosfini gorge. Like most secluded beaches of the Asterousia mountains, Voidomatis offers no facilities other than the natural shade of the caves at the beach. 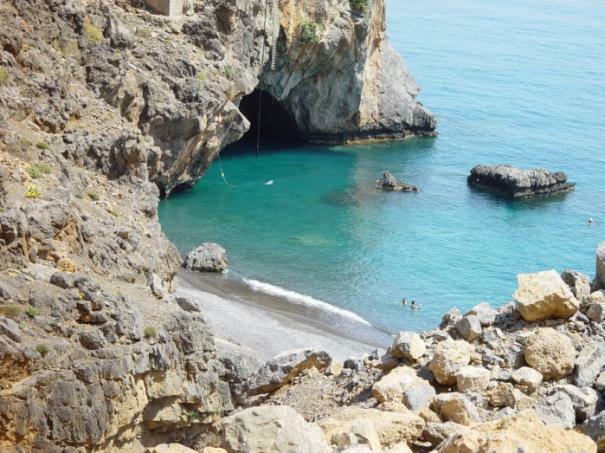 There are two big rocks emerging from the blue waters in the sea, though the main feature of the beach is the awesome huge cave formed in the east end. Just 100m east of Voidomatis beach, there is the small stunning beach of Plysimo (i.e. Washing) which is accessed only by boat. If you choose to drive from Heraklion, take the Stelios Kazantzidis avenue with direction to the south. After about 8km, turn right to the provincial road Knossou-Harakas towards Pyrgos and Prinias. The beach can also be accessed from Treis Ekklisies, through a 2,5km eastern dirt road.